A classic of English cooking, made bigger and better. 6oz / 180g "Well I never, I never would guessed that was margarine"
plus 8ox / 250g icing sugar, for the butter cream icing. The first step was to cream together the sugar and butter-substitute (gotta keep healthy). Easy done. 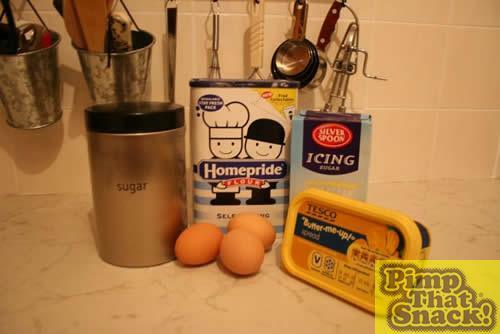 Next up was the eggs; beat them together and start combining them with the mixture. Hmmm…mixing the eggs was taking a bit too long. Maybe it was time to bring in the big guns. Yeah, you're reading that right. There's 600 watts of power in that baby. 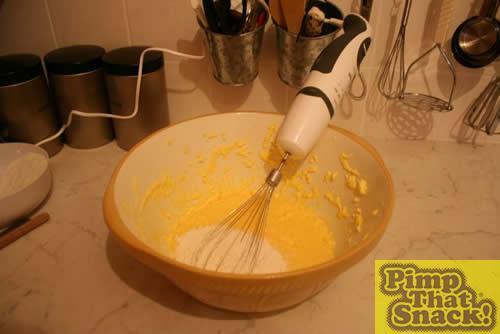 Now that's the kind of power tool a pimper needs in the kitchen. 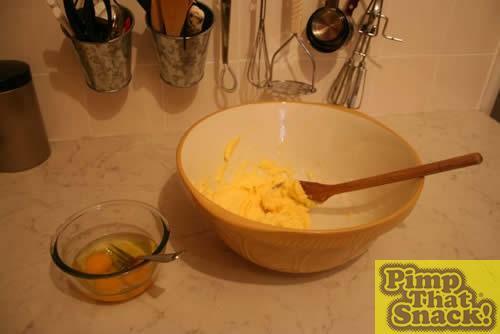 Not only does it make short work of the eggs, but it also dealt very nicely with mixing in the flour.